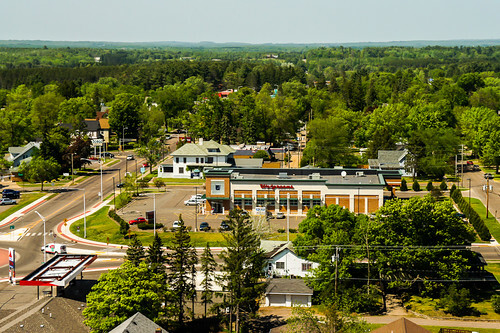 Each year, the Kite Aerial Photography online community holds an event called World Wide Kite Aerial Photography week with the goal of getting out at least once during the week to attempt to capture some aerial images. I didn't get a chance to launch over the weekend, so I made a point to get out after work tonight while it was still windy. 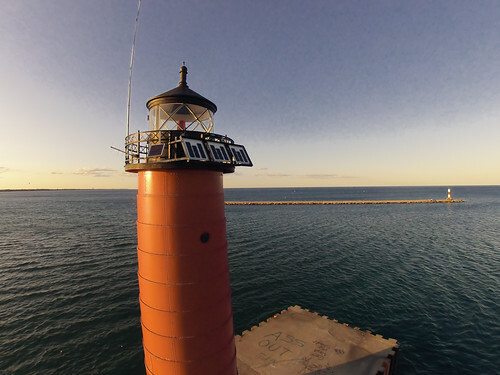 I went down to the Kenosha Lighthouse right before sunset, and flew with a Flowform16 and a GoPro camera. It was very gusty, and didn't want to risk putting up a non-waterproof camera. With some initial challenges, I was able to get some decent shots. 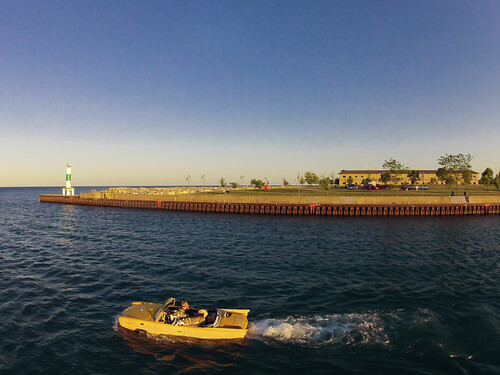 A 1960's Amphicar in the channel, looking to be driven by a couple of huskies. 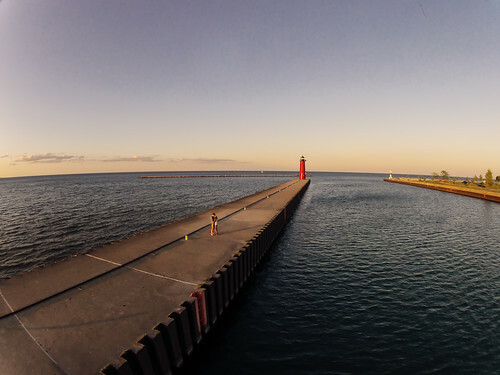 Young love on the Breakwater at Sunset. Great Expect8ions was out on Lake Mendota all weekend, and I was able to get a few quick Pole Aerial Photography picks as they sailed by. 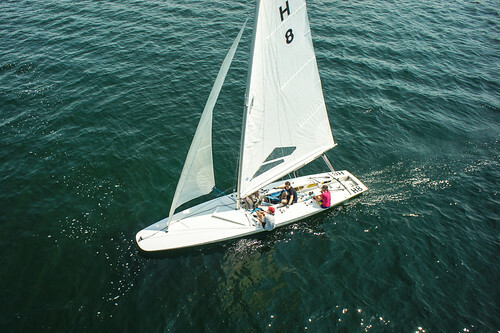 Their registered sail number is H8, and with the popularity of texting, they have been labeled the "Haters". It's sad that something like a name you've had forever turns into something negative due to the evolution of technology. For additional images of the Haters, click here. Walking out on my back porch about a month ago gave me quite a startle, as a bird jumped from her nest. I didn't want to disturb them too much but decided to set up a camera to capture images every 2 minutes and then string them together after a week or so into a time lapse. 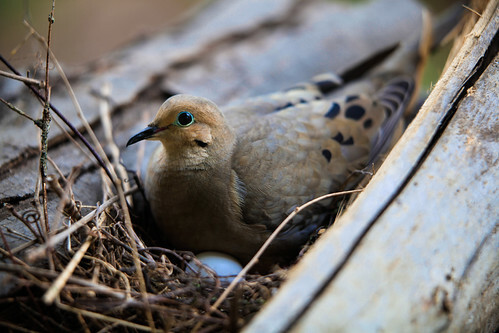 The chicks grew quickly, and mama dove was protective of her chicks. I bought an off-brand power adapter for my Canon G11 and upgraded to one of the newest Eye-Fi wireless SD cards. I configured the CHDK script to take an image every 2 minutes and then wirelessly send the image to my PC inside the house. This way, I could keep the camera rolling until the memory card filled up. Unfortunately, endless mode does not work with CHDK, since the lock tab prevents the software from erasing anything. Some Canon cameras allow you to load CHDK from the firmware update screen, but this is not available on the G11. Every couple of days, when mama was away hunting for food, I went out and got the images off the memory card and then started the script back up. Some of the still images are great, and I think that the time lapse turned out nicely. 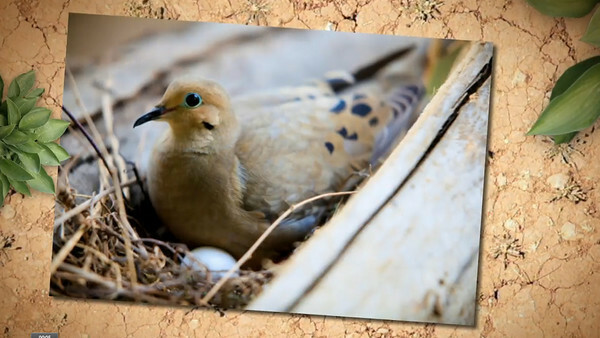 The entire process from laying eggs to abandoning the next was about 3 weeks. 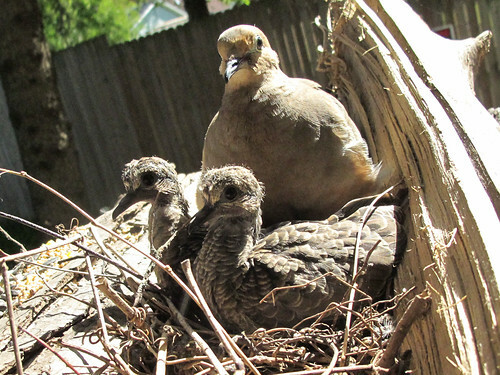 Although the mama and papa dove were together in a few pics, they rarely stayed together long enough to get a proper family portrait. This image is on one of their last days in the nest. Hopefully, they come back next year! I spent last weekend volunteering for a summer camp I used to work for in 1991. 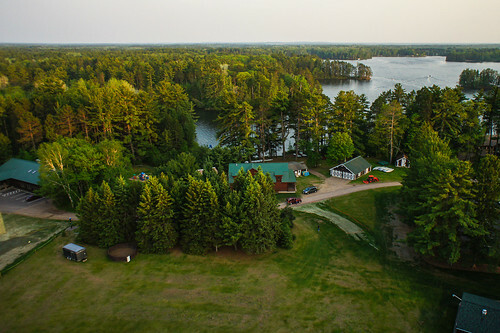 YMCA Camp Jorn is located in beautiful Manitowish Waters in Northern Wisconsin. There have been a ton changes since I worked there more than 20 years ago, and the camp is looking great. Maybe too much progress, but for the most part, everything looks professional and new. After a full day of painting, I managed to grab my camera and get some photo sessions around camp. These are a collection of my favorites from the weekend. 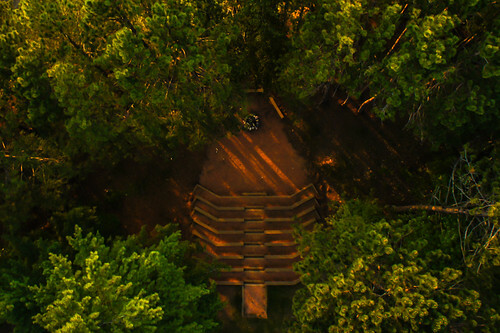 Aerial shot looking straight down at the amphitheater with sun rays peeking through the trees near sunset. This is probably my favorite picture of the trip. Would have been even better filled with kids singing camp songs by the fire. Star Trails near the horse corral on a clear night. 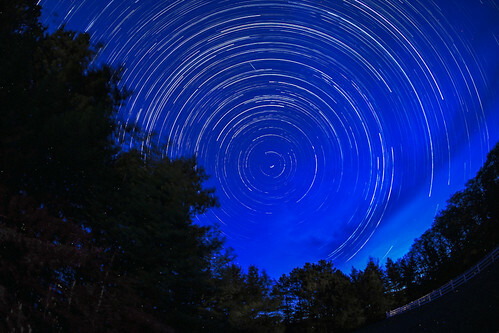 These were 30 second exposures stacked together using the startrails.de software. 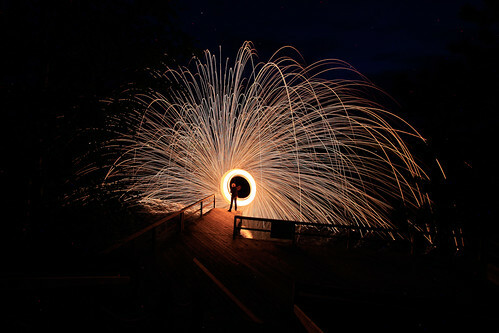 Steel Wool on Fire at the Swim Docks. This is always a crowd-pleaser! 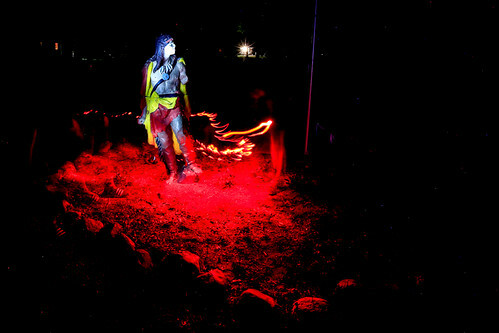 Light Painting seminar in the flickr ball field. 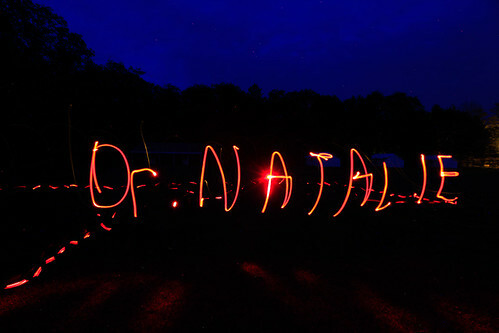 A few people tried their luck at writing backwards with a flashlight. In this picture, the dotted line is my dog Maximus, with a lighted, flashing collar, running around the field. 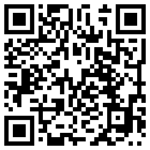 Additional images from the 2012 Camp Jorn Spring Work Weekend can be found by clicking here. 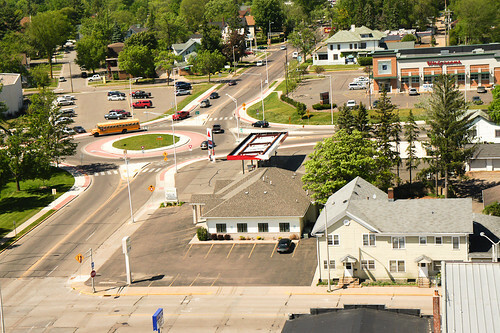 My hometown is Merrill, Wisconsin. At least that is where I grew up. 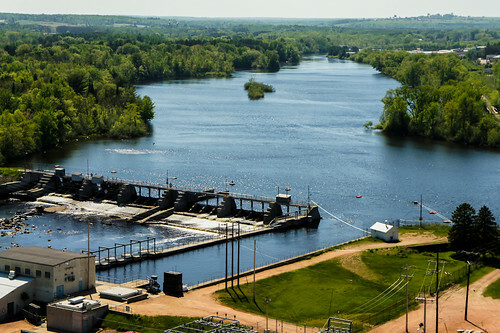 I don't get back to Merrill very often, but try to stop in if I'm on my way up north for any reason. 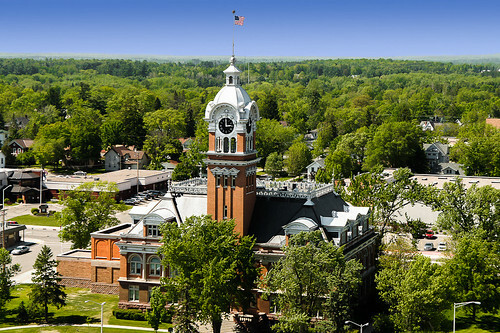 Since I started capturing images by lofting a camera into the air with a Kite, I always thought that it would nice to go back and capture the Merrill Courthouse, as it's pretty distinctive. The conditions were good as I arrived last Friday to launch my kite with south winds. 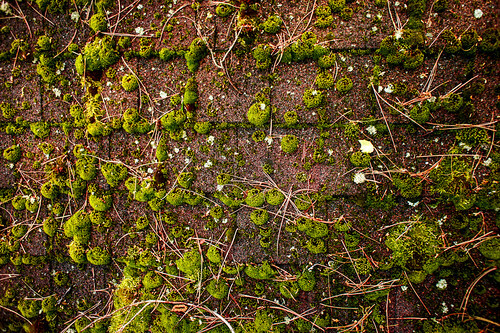 This is the first time I've used anything but my wide angle lens on the Sony NEX-5, as I was standing quite a ways away. Here are the results. Unfortunately, I wasn't able to get any Queenie and Ron's Pizza, as it seems as though it has closed its' doors for good. Go Bluejays! Walgreens, Former spot of my elementary School, Lincoln. 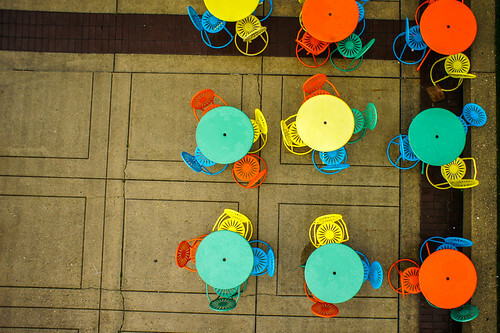 I know that I've captured the Memorial Union Terrace from both my Kite Aerial Photography and Pole Aerial Photography rigs. 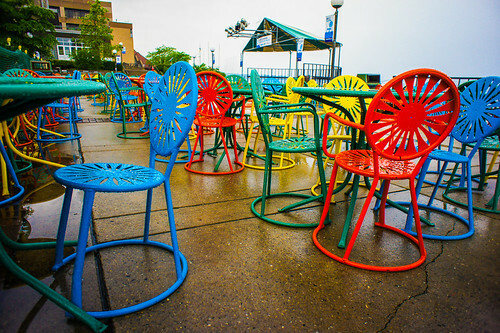 However, the Union is starting a major renovation project of both the lake front as well as some internal remodeling, and have added a new color to the palette on the terrace in the form of a "Mendota Blue" chair. They will be auctioning these chairs off after the end of July, and I knew that I needed to get a quick session before they were gone. Thunderstorms rolled through the Madison area all morning yesterday, and I didn't get a chance to put up the camera until 11:30 am. 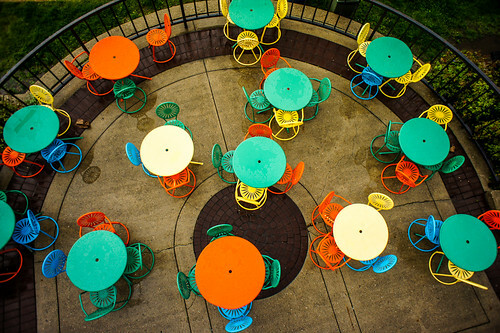 But, the rain kept the terrace free of on-lookers, and I was able to get some good aerial shots. 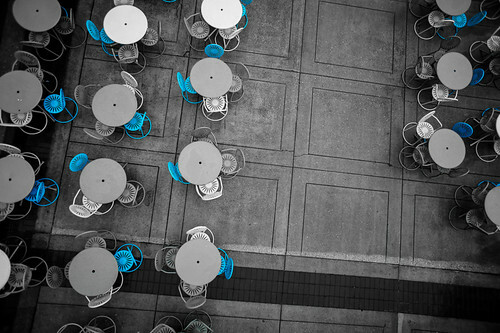 Using Lightroom 4, I removed all color except for blue to showcase the new chair in the terrace family. The rain kept the normal terrace crowd inside, and I had the place to myself. I have a couple of different telescoping carbon fiber poles that I use for Pole Aerial Photography, a 11m and 12.5 meter pole. 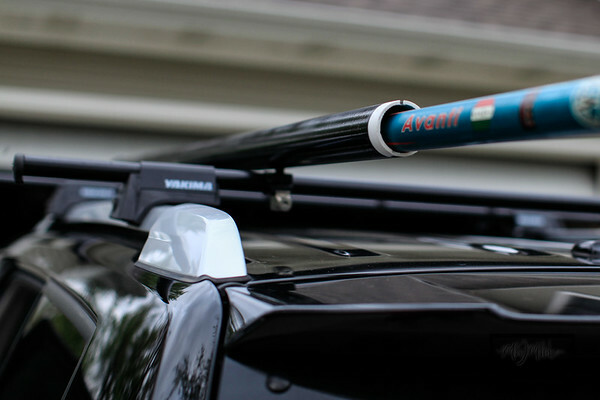 I normally keep one of the poles in the back of my Toyota, but it's always in the way, and I had a feeling that it's going to get broken if I continued to transport it that way. I have 2 Big dogs that ride back there, and I wanted to clear the space, but still have it with me at all times. 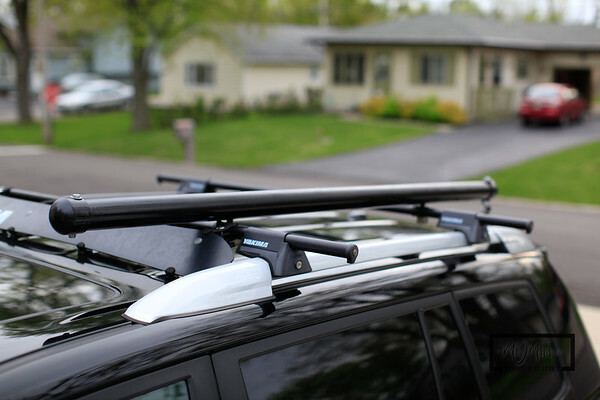 I decided to build a PVC container that is mounted to my Yakima roof rack securely, with he ability to lock the carbon pole inside. 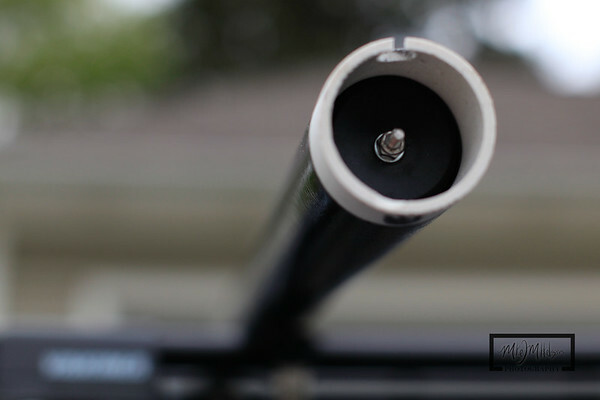 Both poles have a rubber end cap, and they individually fit into a 2" PVC tube. I allocated the proper tubing from the Home Depot with end caps, and used some old rack parts to mount it to the Yakima. I primed and painted the PVC black to match my car and rack. The front end-cap is clued on with a bolt and lock nut securing it in place. 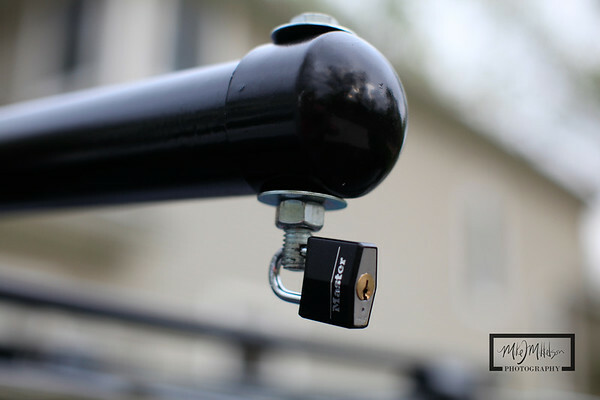 The back end-cap is secured with a larger bolt where the nut is hand tightened. I drilled a hold through the bolt large enough to put a Masterlock on to prevent anyone from peeking inside without the key. I put a small bolt on the end cap of the carbon pole so I would have a way to pull it out from the pipe. The 12.5m carbon pole fits into the tub with about 1" to spare. 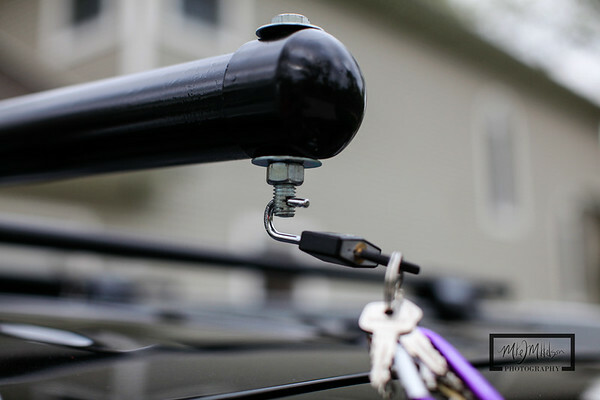 The PVC tube was drilled to enable 2 bolts a couple of feet up from each opening to mount to a standard Yakima rack plastic mount. 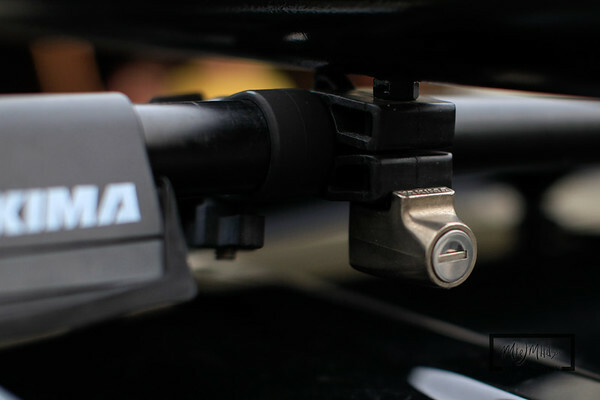 The enables me to lock the PVC tube to the rack a 2 mount points. 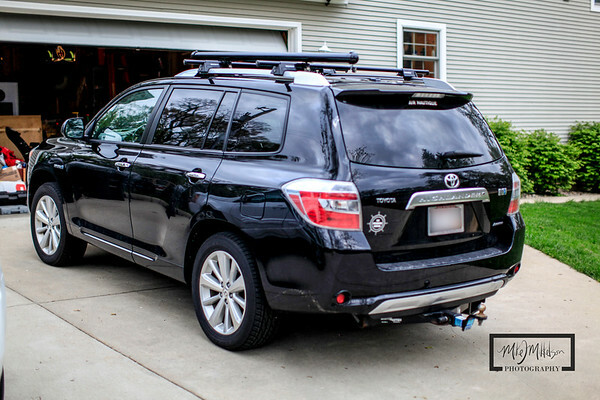 Here's the complete rig mounted on the Highlander, and ready to go for the summer. I always will a pole with me, and just have to remember to bring the camera!